Social media automation is the practice of automating certain aspects of your social media marketing efforts. Automation has many different forms including auto responding when a particular action occurs, automatically posting updates (this is Buffer's bread and butter), or some other automated action. I'm a proponent of working smarter, not harder, and finding ways to be more efficient. I am not a fan of sending automated responses to interactions I receive. However, there is nothing wrong with spending a few minutes each day (or week) to schedule posts / tweets / links, etc. that will be shared with your friends and/or followers. Social media still requires you to interact with your tribe, but you also don't need to be a slave to it by having to manually update everything. 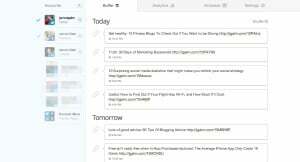 Buffer is a social media update utility that posts your updates at scheduled times. You can use a service like Tweriod to get an “optimum time to post” schedule and import it directly to Buffer. Buffer is a service that operates on a fremium business model, where they'll give you ten buffered updates with a free account. You also have some other restrictions with regard to the number of social media accounts you can connect to the service as well as the frequency and schedule of your updates. However, you have the ability to increase the number of updates you can schedule simply by referring people to the service. Buffer also offers a premium plan for $10 per month which gives you the ability to schedule unlimited updates in your buffer and add up to 12 social network profiles to your account which include Facebook, Linked In, Twitter and App.net. Other social networks are going to be added in the future. 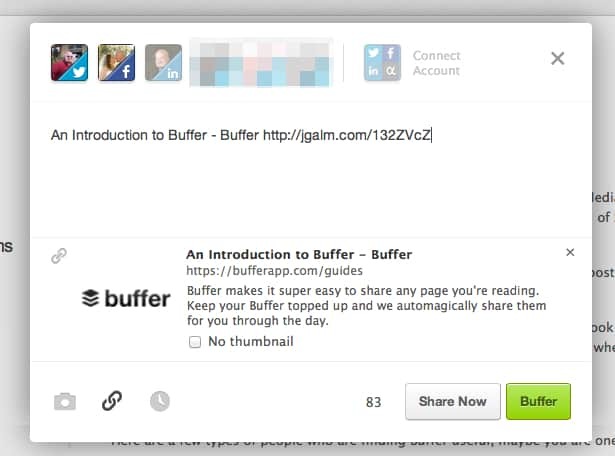 Buffer offers users a variety of ways to access the app. 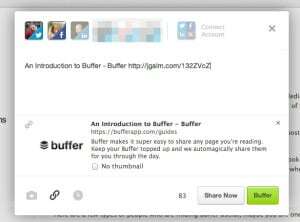 You can add updates via a browser extension, via Buffer's own iPhone App, by visiting the Buffer website or by using one of the hundreds of apps that support Buffer's API. As an example, let's say you're visiting a website and you find something interesting you want to share. You can click the browser extension link and it will bring up an overlay that will contain the page title and the URL. Depending on what social network(s) you're posting to, you'll have a character count and a thumbnail image from the page (character count is for Twitter and the thumbnail is for Facebook). You can also highlight text on a particular page, click the Buffer extension, and that text will appear in the overlay ready to buffer. Once you decide on the networks, and you modify your text to your liking, you can share the content now or add it to your buffer by clicking the appropriate button. One of the truly great things that Buffer offers is a fantastic analytics dashboard where you can see how effective a particular post/update was and is broken down by network. Simply select what profile you want the analytics on (click the tab on the left) and it will show you the numbers. In my modest example, you can see that one of my tweets received a retweet and as a result reached a potential audience of nearly 1,300 people. Pretty neat. It also shows you the “Top Post” or “Top Tweet” so you can quickly see what post garnered the most engagement. 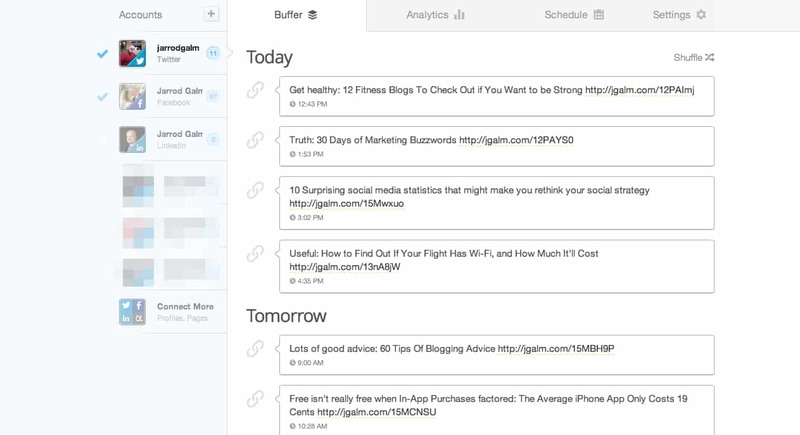 On the Buffer website, you can also edit items in your Buffer before they're sent out. You can reorder items simply by clicking and dragging, and you can drag an item from one social profile to another. You can access other options by moving your mouse over a particular item. These options include deleting the update, sharing the update now, edit the update, or moving it to the top. One final note about Buffer is that they have stellar customer service. 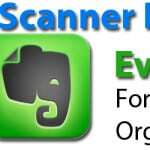 Whether you're a Pro or a free user, they treat all of their users/customers the same. They go out of their way to answer questions, be helpful, or troubleshoot any issues you're having. For instance, I had a quick question about their plans for other social media network integrations and I tweeted @Buffer and within a couple of minutes, their Chief Happiness Officer Carolyn, replied saying that there are more on the way. Truly awesome. There are lots of competitors to Buffer that offer the same or similar functionality. But because Buffer prides itself on offering a fantastic user experience, produces a quality product, and provides awesome customer support, it will always be my number one social media automation tool. And it should be yours too.